Whether you are the bride to be, a maid of honor or a bridesmaid, being an eligible women, means owning yourself, loving your beauty, and letting your inner goddess shine. These days, weddings are all about the pictures, the pictures, the pictures! Most modern weddings nowadays seek out to re-create their love stories through various romantic and enchanting themes, with corresponding decor, dresses, hairstyles, and even photo filters and the perfect photographer to capture this vision of a dream. When selecting makeup for this special day, therefore, it is important to remember this. The pictures will be around for decades, and years to come from now people will still be commenting on your dress and bridal look – including you! DO opt for a timeless look, ensuring that you will still love your pictures and how you looked 15 – 20 years from now. Save the make up experiments for another day! 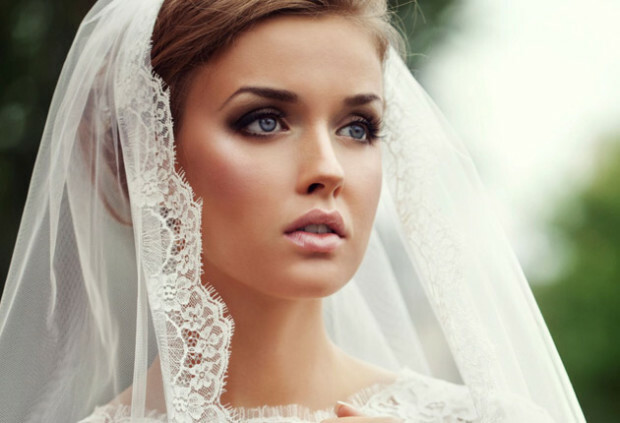 Bridal makeup should be clean, classic, elegant, and effortless. That being said, DO select a look that reflects your personal style or dream and remember that it is your day! Every woman has a vision of how she wants to be seen and remembered, so own it and shine brighter than any other day! DON’T skip out on a makeup trial to save a few bucks. Trials ensure that you will have a stress-free wedding day, where all you have to do is sit back and relax, sip your mimosa and not worry about your makeup or its application. Trials also ensure that you and your beauty team are on the same page about your look, and that there will be no unexpected surprises on your special day. This is why your beauty team will take notes or pictures – so that they can re-create your makeup look and, even perfect it by the time the wedding day arrives. DO select the right makeup artist for YOU. The art of makeup can be a very personal and intimate one, and there should be trust and honesty like any other relationship. On the wedding day, you want to know that while everyone is running around or if you are all of the sudden stressed or anxious, that you can rely on your makeup artist and beauty team to deliver in a calm, friendly, and confident matter, like strong allies on your team. DON’T forget to think ahead and book your make up artist for the full day, so he/she can be there for necessary touch-ups in the evening. At the very least, prepare a bridal makeup kit for freshening up and maintaining your perfection right up until the last beat on the dance floor. Blot papers – to remove unwanted excess oil easily. Pressed or translucent powder – to lightly give the face a refreshed look. Lip Gloss- to spruce up and moisten the lips easily after all the eating and kissing. Mints – for the kissing! DO prepare for a few expected or unexpected tears even if you are not a so called “crier”, as most of my brides say. 😉 It is an emotionally overwhelming and happy day, so waterproof products are a must! DO select lashes that reflect your personal style and comfort levels. Generally, strip lashes are more dramatic and emphatic, but they can often feel heavy after many hours. Personally, I would select these for the experienced lash-wearer, and add lash glue to their bridal kit. If you are weary of lashes or prefer more of a natural beauty book, opt for a few individual lashes. Individual lashes are light-weight, natural, and long- lasting. The good news is that even if you lose a few, your makeup look will not be jeopardized and it will actually go unnoticed. Lash extensions are a great option here too. Wishing you a beautiful Love Day!